Which free agent destination gives Durant the best chance to win a title? We used WhatIfSports.com's NBA simulation engine to determine which team gives Kevin Durant the best odds to win a championship in 2017. Kevin Durant’s free agency features six teams — the Thunder, Spurs, Warriors, Clippers, Heat and Celtics — with varying odds to land the superstar. 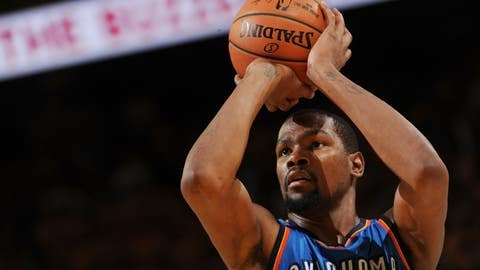 Durant will weigh many factors while deciding that scribes and pundits can only guess at, but what if his sole consideration was winning a championship in 2017? Using WhatIfSports.com’s NBA simulation engine, we added Durant to each of the six teams — at the expense of other players when necessary — and played the teams against the 2015-16 Cavaliers and Warriors. Check out how each team fared, ranked by winning percentage against the two opponents. Disagree with any roster configurations? Build your own squad with the WhatIfSports Dream Team feature. A starting lineup of Goran Dragic, Dwyane Wade, Durant, Chris Bosh and Hassan Whiteside would be among the best in the NBA. Throw in a second unit that includes Joe Johnson, Luol Deng and Justise Winslow, and the Heat are a good bet to emerge out of the Eastern Conference. Such a roster would require several charitable contracts, however. A more realistic acquisition of Durant will cost the Heat Whiteside, who’s set to land a max deal, and free agent Deng. Without Whiteside and Deng in the mix, the new-look Heat still may not be good enough to supplant Cleveland in the Eastern Conference. In 1,001 simulations, the Heat beat the Cavs just 33.0 percent of the time. Against the Warriors, their win percentage dropped to 17.7. The Celtics have an enviable amount of cap space and could add Durant without scrapping their overachieving core of Isaiah Thomas, Avery Bradley and Jae Crowder. Moreover, the Celtics would be Durant’s team from day one, with Thomas the only All-Star on the current roster. But if it’s championship contention Durant is after, his presence alone isn’t a lock to bring the Larry O’Brien Trophy to Beantown. What if Boston can add both Durant and Al Horford, only at the expense of free agent Evan Turner? That rendition topped Cleveland in 62.6 percent of simulations but still fell to the Warriors. The Clippers already have a formidable Big Three in Chris Paul, Blake Griffin and DeAndre Jordan, but the trio have been in place for five seasons and have yet to advance to the Western Conference finals. The prevailing theory is that adding Durant to the mix would be at the expense of Griffin, who could move to Oklahoma City in a sign-and-trade. A core of Paul, Durant and Jordan would be an upgrade for the Clippers, but may not be enough to win the Western Conference. In 1,001 simulations, Golden State prevailed 50.7 percent of the time. If the Clippers did reach the NBA Finals though, they’d be favored over Cleveland, winning 65.2 percent of simulations. Durant’s most likely destination seems to be Oklahoma City, where he and Russell Westbrook can attempt to avenge a seven-game loss to Golden State in the Western Conference finals. After trading Serge Ibaka to the Orlando Magic for Victor Oladipo, Ersan Ilyasova and rookie Domantas Sabonis, the retooled Thunder should be a more balanced team. And the Thunder brass may not be done tinkering yet. Reports have surfaced that the Thunder are trying to clear more cap space by moving Enes Kanter and Kyle Singler, with Horford the likely target. Adding Horford to the Thunder may not be enough to put the team over the hump, however. A roster of Westbrook, Oladipo, Durant and Horford won 48.6 percent of games against the Warriors and 69.1 percent against the Cavaliers. The Warriors are fresh off the best regular season in NBA history, but the opportunity to add Durant is too good to pass up. To clear cap space, Golden State would likely have to bid farewell to Harrison Barnes and Festus Ezeli, plus move a valuable role player like Shaun Livingston. But imagine a lineup with Steph Curry, Klay Thompson, Andre Iguodala, Durant and Draymond Green. Forget NBA championships, the Warriors would instantly contend for the best team of all time. In a potential rematch with Cleveland, the Cavs would be hopelessly outgunned, as the WhatIfSports NBA simulation engine sees the Warriors winning 83.5 percent of the time versus the reigning champs.